HZ-ZAC at Jeddah - OEJN. N491K with different lighting, at Vancouver - CYVR, British Columbia. N491K of KATMAI AIR, at Lake Hood. N491K getting ready for a busy season. • 306 United Nations Organisation (UN). Delivered 18-Feb-1963. Entered service with 134 Air Transport Unit (ATU), an RCAF unit which was operating on behalf of the UN. Post Jun-1963 until Dec-1963. Dec-1963. Put into storage with 115 ATU, RCAF at El Arish, Egypt, pending disposal. 115 ATU was another RCAF unit supporting a UN mission. • HZ-ZAC Saudi Arabian Ministry of Petroleum and Mineral Resources, Jeddah. Saudi Arabia. Regd 21-Feb-1964. Withdrawn from use in early 1980. • C-GIWF Joseph Di Giacinto, Fredericton, NB. Based Calgary, AB. Regd 23-Nov-1989. • N49KA Katmailand Inc. This registration is unconfirmed. • N491K Katmai Air LLC., Anchorage, AK. Based King Salmon, AK. Regd Apr-1990. Power plant: Converted with a Polish PZL 1,000 horse power engine during 1998. • N491K Katmai Air Leasing LLC., Anchorage, AK. Re regd 15-Oct-2001. Power plant: Converted to Texas Turbine at Kal Air, Vernon, BC in 2012. Otter 434 was delivered to the United Nations Organisation (UN) on 18th February 1963 with serial 306. It was one of four delivered to the UN at that time, the other three being 433 (UN serial 305), 436 (UN serial 307) and 437 (UN serial 308). All four were packed into crates at Downsview and shipped to the Congo, where they arrived at Leopoldsville in June 1963. Three of these Otters (306, 307 and 308) were unpacked on arrival and transported by USAF Hercules to Aden in the Yemen, where there was a requirement for Otters with the UN Observation Mission in the Yemen. In Aden, the three Otters were re-assembled and entered service with 134 Air Transport Unit (ATU), an RCAF unit which was operating the Otters on behalf of the UN. 134 ATU also operated some Caribou aircraft, and had bases at Sanaa, Quizan and Najran. Otters 306 and 308 were based at Najran. This operation continued until December 1963, when 134 ATU was disbanded, and it was arranged to ferry the Otters to El Arish in Egypt, where they would be put into storage with 115 ATU, pending disposal. 115 ATU was another RCAF unit supporting a UN mission as part of the Arab-Israeli cease fire. Both 306 and 308 encountered some difficulty on the ferry flight from Najran to El Arish, as the following extract from the 115 ATU history explains, referring to the 17th January 1964: “UN Otter 308 force landed in the desert 55 miles from Jeddah in Saudi Arabia with a blown cylinder. The aircraft was towed to Jeddah. A crew was sent from El Arish on 4th February and changed the engine. The Otter was flown to El Arish on 29th February. Also on 17th January, UN Otter 306 landed at Jeddah out of oil. Contamination was found in the oil filter. A crew was sent from El Arish on 4th February to repair 306 as well as change the engine on 308. Otter 306 was sold to Saudi Arabia on site”. While the two Otters were on the ground at Jeddah, the Saudi Arabian government became aware they were for sale, and bought 306 for use by its Ministry of Petroleum and Mineral Resources, which was based in Jeddah. The Otter was registered to its new owners as HZ-ZAC on 21st February 1964. It was to serve the Ministry for the next 16 years, supplying desert geological and drill camps. It was also used for aerial photography and geophysical surveys, and its logbook recorded many a nine and ten hour day. It was withdrawn from use in early 1980, having been replaced by the DHC-6 Twin Otter. 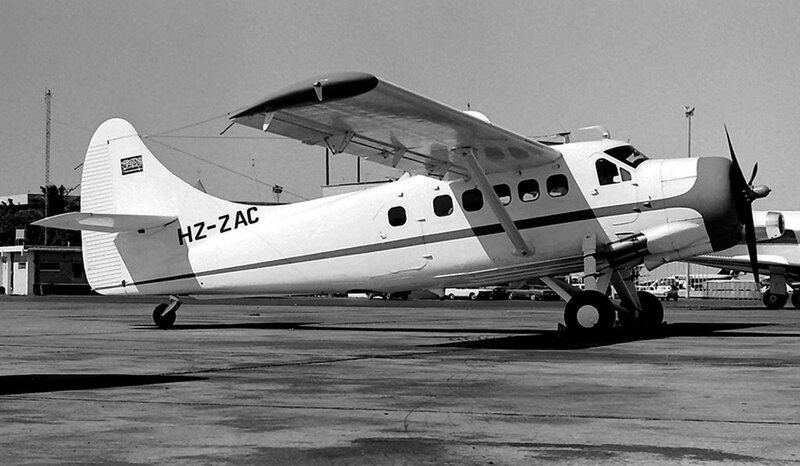 HZ-PL3, the first Twin Otter, was acquired in September 1979, followed by HZ-PL4 in December 79 and HZ-PL5 followed in 1982. Otter HZ-ZAC was put up for sale, although it was to remain in storage in Saudi Arabia for several years, until a buyer was found. It was not in fact sold until 1989, and was purchased by a Mr Joseph Di Giacinto of Fredericton, New Brunswick, an Air Canada captain who had bought it to lease out. The Otter was shipped from Saudi Arabia to Calgary. 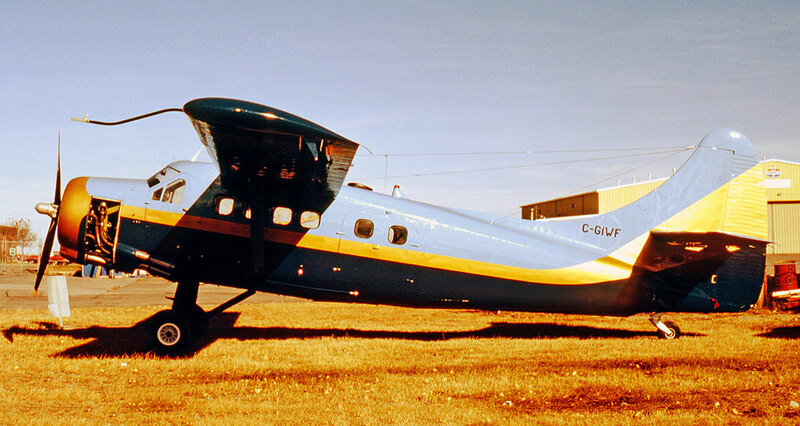 During September 1989 the Otter was painted as C-GIWF for a lease to Chisasibi Air Transport, but the lease fell through and the Otter remained in store at Calgary. It was formally registered C-GIWF to Mr Di Giacinto on 23rd November 1989. 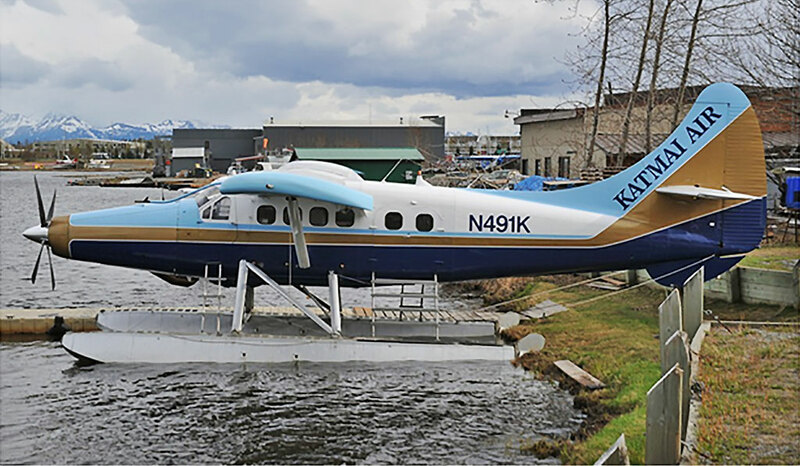 It spent the winter in Calgary and was then sold to Katmai Air LLC., Anchorage, Alaska in April 1990 and registered to its new owners as N491K. It was still at Calgary on 10th April 1990, but by 19th April had arrived at Vancouver. It passed through Ketchikan on 16th May 1991 on its delivery flight to Anchorage. 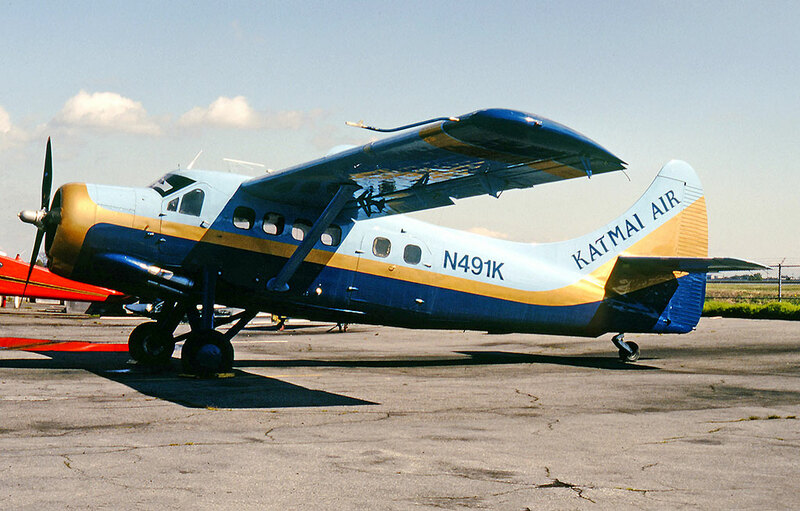 Katmailand Inc., had been formed by veteran Alaskan bush pilot Ray Petersen and had been granted the only lodging concessions inside the Katmai National Park. Founding the first sport fishing lodges in the Bristol Bay area gave Mr Petersen the pick of the best spots. The lodges he built were known as Angler’s Paradise Lodges, the first and most famous of which was at Brook’s Lodge. Katmai Air was established to bring the guests to the lodges and for fly-out fishing. The Otter joined a fleet of Cessna 206 / 207s, a Beaver and a Navajo. The fleet was active during the summer months based out of King Salmon and in storage at Anchorage over the winters. In addition to the fishing lodge guests, the Otter also brought tourists to the National Park for bear viewing, with flights from Naknek Lake, King Salmon into the Park. 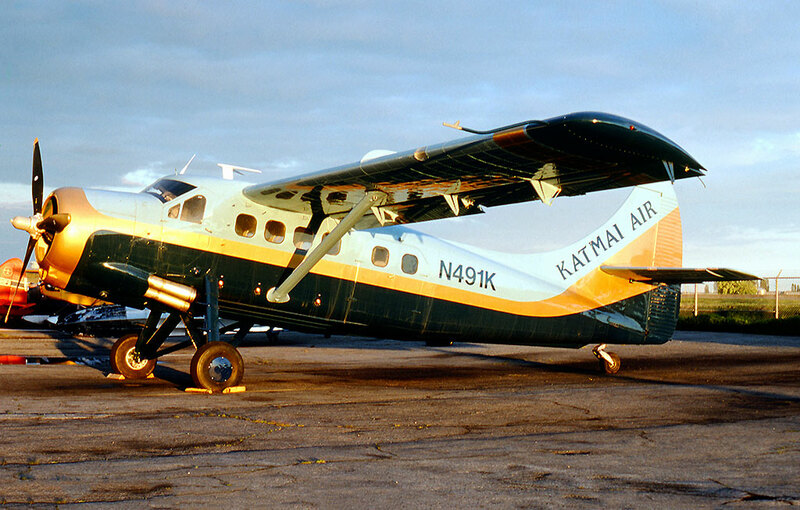 The Otter would fly for Katmai Air for many years. In 1998 it was converted with a Polish PZL-1000 engine, the fifteenth such conversion. 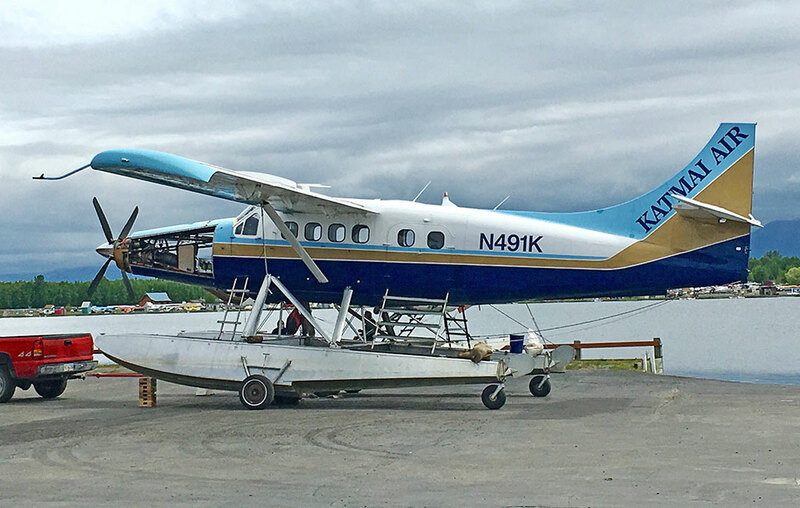 On 15 October 2001 the registered owner was changed to Katmai Air Leasing LLC of Anchorage but the Otter continued in operation by Katmai Air LLC., on lease, servicing the fishing guests of the Angler’s Paradise Lodges and flying the tourists. In early October 2008 N491K arrived at Vernon, BC., for turbine conversion by Kal Air. This would be a Texas Turbine conversion with the Garrett TPE331 engine, the 37th such Otter conversion, but only the second to use the -12 engine . It made its first test flight after conversion on 21 January 2009. This was to be the last turbine conversion by Kal Air. Shortly after it was completed, Kal Air was put up for sale by its owners as a going concern, but when no buyer emerged, the company as closed down. After further testing and completion of the conversion, N491K departed Vernon on 21 March 2009 en route back to Alaska, where it resumed service with Katmai Air. 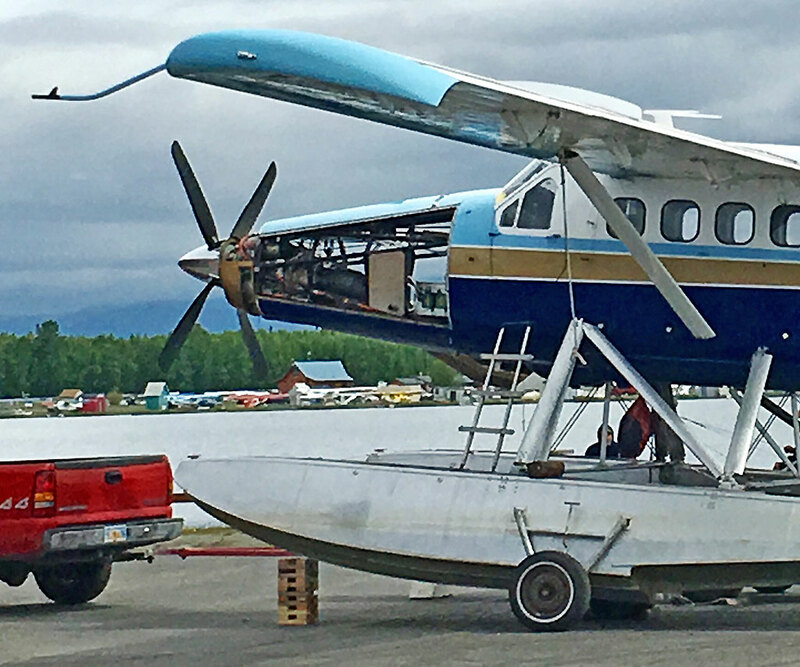 Over the years that followed it continued to provide transportation for the fishing lodge guests and bear viewing tourist between Anchorage and King Salmon and within the Katmai National Park. It was still engaged on these tasks during summer 2018.